The Stuart Successions Database is the central, open-access output from a four-year research project funded by the Arts and Humanities Research Council. Led by researchers from the universities of Exeter and Oxford, The Stuart Successions Project aimed to identify and interpret the wealth of material published in response to each of the six Stuart successions: i.e. those of James VI and I (1603), Charles I (1625), Charles II (1660), James II (1685), William III and Mary II (1688-89), and Anne (1702). In the interests of establishing a more complete picture of the period, the project also covered the accessions to the role of Lord Protector of Oliver Cromwell (1653) and his son Richard (1658). The Stuart Successions Project was based on the hypothesis that it is possible to identify a category of ‘succession literature’. In practice, this category encompasses a wide range of genres and forms, including: elegies, panegyrics, ballads, sermons, histories, genealogies, prayers, proclamations and speeches. Despite these manifest variations, all such material is united by a common purpose, to reflect upon a moment of succession. And the Stuart era stands as the great age of British succession writing. By comparison with the Tudor successions, the Stuarts all faced greater public scrutiny and comment, on account of the rapid growth of print culture. Moreover, while much of the literature welcoming the Tudor monarchs to their thrones was written in Latin, by the seventeenth century most relevant texts were published in the vernacular. The Stuart century produced some of the best panegyric poetry in the English language, and much of this was stimulated by successions. Poets listed in the database include some of the leading writers of the age: Ben Jonson, John Dryden, Aphra Behn and Edmund Waller, to name just a few. While the phenomenon of Stuart succession literature has long been recognized by scholars of the period, it has never been the subject of concentrated analysis. Studies to date have tended to focus on momentous or controversial years of succession, such as 1603, 1660 and 1688-89. The monumental work of one of the project’s initiators, the late Kevin Sharpe, surveying all representations of Tudor and Stuart monarchy, served further to draw attention to the wealth of available material. In this context, the database is intended as a kind of map, opening multiple pathways to the interpretation and analysis of succession writing. ‘The Stuart Successions Project’ has made a start on the task of interpretation: one of our principal outputs, alongside the database, is Literature of the Stuart Successions, ed. Paulina Kewes and Andrew McRae (Oxford: Oxford University Press, forthcoming 2017). This volume presents a coordinated collection of different approaches to succession writing across the Stuart era; our goal was to model some approaches to interpretation, and then to open routes into the material for future researchers. While we hope that the database will be relatively straightforward for researchers to use, a full introduction is available here. 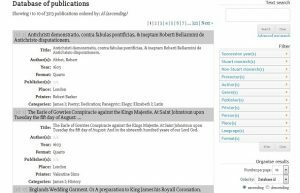 It is designed to outline: the potential value of succession literature to researchers of seventeenth-century literature and history; the principles that governed the compilation of the database; and its functionality for future researchers.